On June 21st, GRNC members and supporters got together to Celebrate Twenty Years of Victory. At the 2014 Annual Dinner, we pulled out all the stops and hosted some of the nation’s greatest gun rights experts and proponents. One lucky guy even won an autographed Ted Nugent guitar! If you missed this year’s celebration, you just might regret it, but we can help with that. We’re sending this update so you can at least see what you missed. Below, among other things, you’ll find links to videos and photos of the celebration. Have a look, enjoy, and start imagining how quickly you’re going to jump on tickets for next year’s annual dinner. “Twenty Years of Victory” T-shirt! 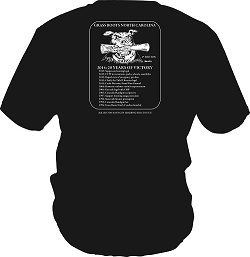 GRNC is a gun-rights machine, and what better way to let everyone know you’re on the perennial winning team than a “Twenty Years of Victory” T-shirt? Click here to order yours today! 2013: Suppressor hunting . . .
It’s true, GRNC is a gun rights juggernaut, as evidenced by all of the great victories we’ve achieved over the last twenty years. You can bet that GRNC will remain just as aggressive, and continue to fight for your rights in the years to come. Of course to do that, we will need your continued help Please contribute so we can extend our long chain of guns rights victories. Click here to donate. GRNC Update 08-16-2012: Greensboro Gun Show Needs Volunteers!